All you ask from an outfit for the new season is just cheap at Kmart. They have the best clothing products, shorts, t-shirts etc. Find hats, shirts, lace up shoes and more casual wear for men at Kmart Catalogue. Visit pg 24-25 for Chino Shorts. They are designed for the absolute comfort when gaming, walking, biking, laying, standing, waiting and whatever you do with a short. It's an ultimate tool to keep your legs cool and good-looking. When it's hotter, it's unbearable to wear pants. Jeans is a nightmare, too. Besides, while resting in a tropical place or a holiday location, wearing short looks cooler than pants. Chino shorts looks kind of formal as well. You need to combine it with a nice piece of the shirt but they are always feeling good. That's what matters. 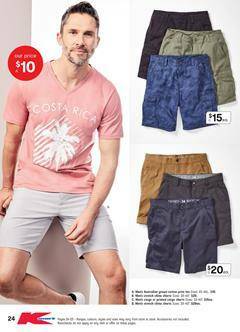 Find more products from Kmart men's clothing, cotton tees. Kmart has 24 hours stores, too. Check out their locations and buy your favourite product after you browse the catalogues.